Eastlake III includes the communities of Eastlake Trails, Eastlake Trails North, Eastlake Woods and Eastlake Vistas. Eastlake Trails was built first and then Eastlake Woods and Eastlake Vistas were built at the same time. There is also an Eastlake Trails North which is sometimes called Eastlake Woods West. Eastlake Trails North is northwest of Eastlake Trails on the other side of Hunte Parkway and Otay Lakes Road. This area has 2 single family detached communities and is really its own community unto itself. Eastlake Trails is a mixed housing community of 2 condo complexes, small homes ranging from the low 1,000 square feet range all the way up to 3,700+ square feet. The smaller homes are sought after because in the Woods and Vistas they were all medium to large and even mansion sized homes. The Woods having the largest homes on the largest lots including The Gates at the Woods by Eastlake which were custom home lots. There were no condos built in the Woods and two condo complexes built in the Vistas. Neighborhoods with homes include; Bridlewood, Creekside Estates, Hillgate, Monterrey Point, Monterrey Ridge, Parkplace, Sagewood, Sierra, Sevilla and Woodcreek. Neighborhoods with condos include; Sycamore Ridge I and Sycamore Ridge II. Neighborhoods with homes include; Abilene, Acqua, Bridgepark, Colrich, Monticello, Lost Creek and Valencia. Neighborhoods with condos include; Sonora Ridge and Summerhill. 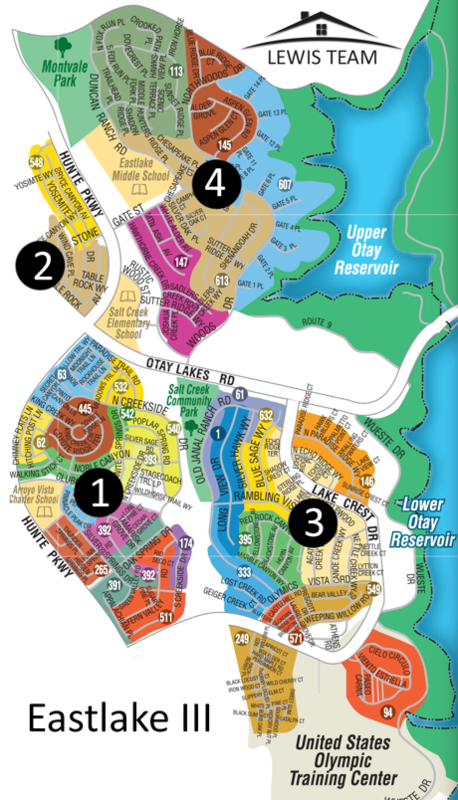 Interested in Eastlake III Real Estate? We are The Eastlake Real Estate Experts!